While it’s possible to manage sleep apnea with lifestyle changes like weight loss and smoking cessation, many people still require assistance from external devices to help manage their symptoms. These devices are worn to bed and provide patients with extra support to keep their airways open. There are several options available depending on the severity and nature of a sufferer’s sleep apnea, but the most common involve some sort of mask or mouthpiece. Here is a quick look at three common varieties of these products. Continuous positive airway pressure, or CPAP, machines are the most commonly used treatment for sleep apnea. The machine uses a mask to provide patients with a continuous stream of air that keeps their airways open and working normally. The mask typically only covers the nose (known as a NCPAP mask), but for particularly severe cases the mouth and nose both may be covered. Research has indicated that CPAP machines not only improve nighttime breathing in patients but also help regulate their blood pressure and reduce their risk of heart failure. 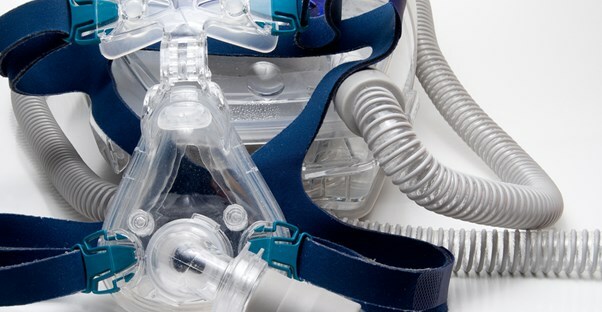 Mandibular advancement devices, or MAD for short, are used to treat patients whose sleep apnea is not severe enough to warrant the use of a CPAP machine. This product, which looks similar to a sports mouthpiece, is designed to move the lower jaw forward—allowing airways to stay unobstructed. Many of these devices allow patients to adjust the degree of jaw movement, depending on their comfort level and the severity of their condition. Tongue retaining devices are less common than CPAP machines and MAD mouthpieces, but they can still be effective at improving the symptoms of sleep apnea if a patient’s tongue is unusually large and problematic. The device keeps the tongue towards the front of the mouth and won’t allow it to slip out of position and back towards the throat. Multiple studies have shown tongue retaining devices to be effective, but they are not ideal for all forms of sleep apnea—especially those that involve obstruction of the nasal passages.